This 1815/2 Capped Bust Half Dollar in NGC MS-64 would make a fine addition to your collection. This piece is the key date coin to the Capped Bust Half Dollar set and is a true high-end ultra rarity. 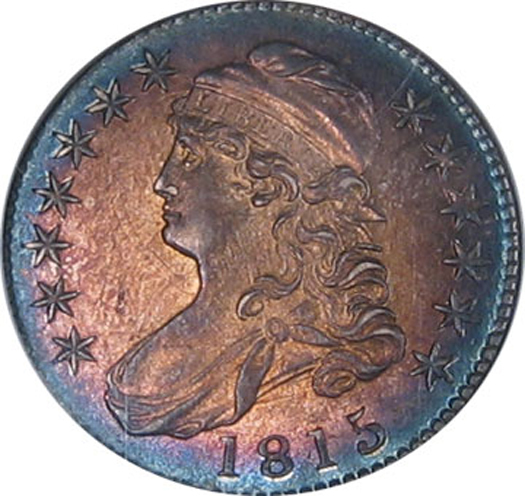 With absolutely breathtaking eye-appeal, the coin exhibits nearly mark free obverse and reverse surfaces, with diagnostic die clashing for the date visible. The specimen exhibits stunning, original Wayte Raymond toning. The radial color transitions form deep steel blue, to violet, to red, to a light golden hue at the coin's center. 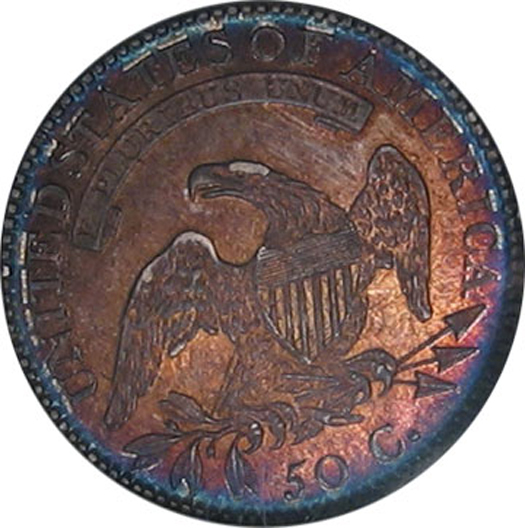 The coin retains flashy luster beneath the richly toned surfaces. The population for this date is virtually nonexistent. There are only 28 total uncirculated examples graded by either grading service, a number of these certainly being resubmissions. There are only 2 MS-64 coins graded by NGC, with only 1 graded MS-65. The true population is likely somewhat less than the population numbers. Trends presently lists this coin at $60,000, and the current asking price is a great value. This coin is severely undervalued when compared to other key date coins and coins of similar rarity. Previously pedigreed to the Pryor collection.